D. D. Palmer teaches 5 chiropractic students: Solon M. Langworthy, Allan Raymond, Thomas H. Storey, H. Ray Stouder, E.E. (Lee) Sutton. Dr. Solon M. Langworthy, a 1901 graduate, established the Langworthy School of Chiropractic in Cedar Rapids, Iowa that later becomes the American Chiropractic College. In 1901 the Texas legislature repealed all existing laws on medical practice and divided the field into three parts – medical, eclectic and homeopathic. July 18, 1901 – A. E. COSTON, D.C. is born in Cranfills Gap, Texas. Both his father and grandfather were practicing physicians. He will receive the Keeler Plaque for chiropractic service. In 1901, Palmer was still teaching the first of the several theories of chiropractic he eventually offered. This initial set of hypotheses and assumptions comprised a decidedly mechanistic view. Palmer likened the human body to a fine watch and identified himself as a "human mechanic" (Palmer, 1897). This first chiropractic theory, a derivative of his nine years of practice as a magnetic, proposed that inflammation (which Palmer saw as the essential characteristic of dis-ease). Palmer was not yet exclusively concerned with bones-pinching-nerves, Old Dad Chiro would manipulate to adjust any displaced anatomy he found, including arteries, veins, nerves, muscles, bones, ligaments and joints. The range of patient conditions Palmer accepted for treatment (his terminology at the time) was as broad as A.T. Still's osteopathy, although the theoretical bases for these two manipulative arts were distinctly different. 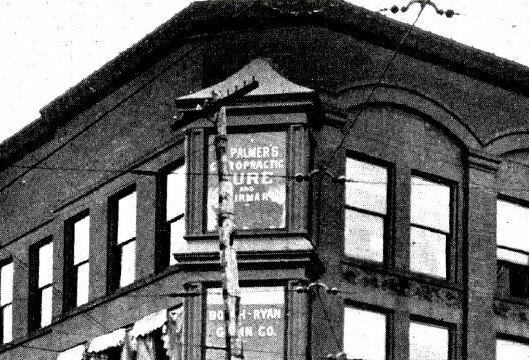 D. D. Palmer incorporated his thriving, 40-bed facility on the fourth floor of the Ryan building as the Palmer School of Magnetic Cure in the summer of 1896, where he also trained a few individuals in the new healing art of chiropractic, although never more than three at a time. Willard Carver "although having no practical contact with patients, had decided to announce a system of healing...the system of Relatolity...a system involving some form of manipulation, massage and psychology ...." January 1, 1896, was the date planned by Willard Carver to announce a new system of healing to the world – the system of “Relatolity." September 18, 1895 – D. D. Palmer successfully adjusted the spine of Harvey Lillard. Palmer was 50 years old. B. J. Palmer is 13 years old. He drops out of school. September 24, 1895 – D. D. Palmer writes Willard Carver describing the first adjustment in detail. The letter is lost to history. 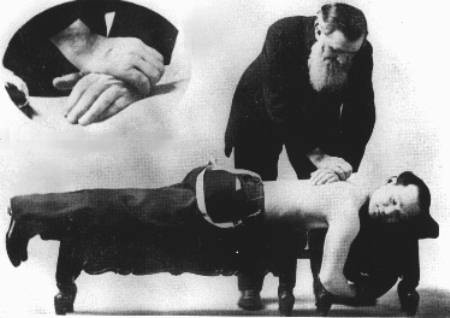 Late Fall 1895 – D. D. Palmer has developed four methods of adjusting the vertebrae of the spine. An amendment of the Texas Medical Association’s constitution in 1893 permitted membership to female physicians, but not to black doctors.